This post originally appeared a few years ago. I'm sharing it again because Desmos was just added as an option in OneNote. 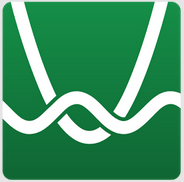 Desmos is a free graphing calculator that is available to use in your web browser and as an Android and iPad app. The Desmos calculator performs all of the functions you would expect to see in a graphing calculator with a couple of extras that you don't find in typical graphing calculators. Desmos allows you to share your equations and graphs. Desmos graphs your equations as you type them and redraws them as you alter your equations. Desmos offers a good collection of resources for teachers. The teacher resources page features a dozen pre-made activities that you can distribute to students. The activities take advantage of the functions in Desmos while helping your students learn about graphing, problem modeling, algebra, and geometry. Once you've reviewed some of the pre-made activities in Desmos you can use the Desmos activity builder to create your own lessons and distribute them to your students.